This situation where the drop sits on the top of the micro-pillars is not always the most stable: the liquid can prefer to fill in the microstructure. We have studied the transition between the “fakir” state and this second state by different ways: by pressing drops between two surfaces, by letting drops evaporate and by carrying impact experiments. We have observed that the transition depends on the geometric characteristics of the array and disappears for the roughest surfaces. Impact experiments have led us to observe unusual splash patterns that adopt the symmetries of the underlying lattice. We have also achieved surfaces displaying gradients in the density of micro-pillars and have discussed the possibility to observe spontaneous movement of droplets. At last, we have studied the wicking of well-defined surfaces by wetting liquids and have inferred laws of imbibition. On such surfaces, drops of water are very mobile and their dynamics is yet to be understood. In order to study dissipation forces acting on such objects, we study droplets going down an superhydrophobic incline. After a while, a constant speed is reached, as the weight of the droplet and the dissipative forces are equals, giving a measurement of these forces for the critical speed. One can also observe various behaviours : droplets can roll like marbles, slip on the superhydrophobic surface, or adopt unusual shapes like the one presented on the image opposite. When a water droplet meets a hot surface, it starts to boil and turns into vapor very quickly. But when the surface is clearly above the boiling temperature, the vapor forms quickly enough to create a thin layer between the surface and the drop, which is therefore levitating This vapor film has two roles : 1) it isolates the drop from the substrate ; the drop does not boil and lasts for several minutes. 2) as was the case on the lotus leaf, the liquid gets a very rounded shape and does not stick to the surface, which gives it an extreme mobility. This state is called calefaction (this is also sometimes called Leidenfrost effect). Such drops can also be made on a substrate at ambiant temperature with liquid nitrogen (-196°C). This system allows to change the substrate material. On the figure opposite, we see a drop of liquid nitrogen in calefaction over a bath of water. Since late 2009, we study the case of calefaction of liquid oxygen droplets. As liquid nitrogen, this liquid is very cold (-183°C) and subsequently in calefaction on a substrate at ambiant temperature. The difference is that liquid oxygen is paramagnetic : it undergoes a force when placed under a gradient of magnetic field. Using magnets, we can therefore trap those drops, which are usually very mobile and hard to manipulate, and guide them at will. Self-propelled systems are systems for which we observe a spontaneous movement, without any external action. Those systems have an instrinsic asymmetry, which determines the direction of the movement. A few of these systems are studied in the lab. The first one is a device using calefaction, which gives to the drops a high mobility without any preferential direction. Putting such a drop on an asymmetrically-textured surface (ratchet), the movement will always be in the same direction : the texture of the surface forces the underlying vapor film to escape from under the drop preferentially in one direction. This, because of the law of action and reaction (or rocket effect) propels the drop in the opposite direction. This experiment was first made by Heiner Linke. We have confirmed the hypothesis of the rocket effect, using a piece of dry ice (solid carbon dioxide) on this same textured surface. Carbon dioxide has no liquid phase at ambiant pressure ; it sublimates directly from solid to gas at -80°C. In this movie, we put a piece of dry ice on the textured surface ; we observe that it accelerates in the same direction as Linke’s drops. Unlike drops, the piece of ice can not deform ; there is no curvature of the interface, no Laplace pressure ; no Marangoni effect, no waves. The propulsion mechanism resluts of the viscous stress due to the vapor flow. Another self-propelled device that we study uses the action of surfactants to create a movement. Surfactants (“Surface Active Agents“) are molecules that are present in most cleaning products (soap, washing liquid, detergents, etc.) because they have a specific action on surfaces : the principal effect is to reduce the value of the surface tension. Therefore, a stain will be easier to remove with surfactants, which are going to act at the interface between water and the stain. The self-propelled system is a capillary tube filled with pure water and containing a drop of oil at its center. We create the asymmetry by adding surfactants on one side of the drop of oil. Surfactants will modify the water/air surface tension on one side but not the other. This will cause the drop to move as we can see in this movie. The movie begins a few tens of seconds after the injection of surfactants on the left side of the drop. We observe that the drop moves towards the surfactant ; accelerates and reaches a constant velocity ; enventually it reaches the end of the tube and even manages to go out ! We study different impact situations between solids and liquids. One can want that a drop falling on a surface to spread — for example when treating a surface with an aerosol — or on the contrary to be evacuated quickly — like raindrops on windshields. We have shown the remarquable behavior of drops thrown on specific solid surfaces : on hot surfaces as well as on superhydrophobic surfaces, drops can bounce ; on fibers (small compared to the drop) they can be caught, as dew drops on spider webs. Another way to capture or slow down drops is to use soap films : depending on their veolcity, they can bounce or go through the film without breaking it. Likewise, the film can resist to the impact of a small solid object. An efficient system to stop projectiles thrown at a grat velocity is liquid foam (like shaving cream). We have studied the deceleration of a bead thrown at a great speed in foam to understand its damping properties. We have also studied the impact of a rotating bead in a bath of water. The bead does not follow a straight line once in water. Indeed, the rotation creates a force that is perpendicular to the trajectory of the bead (a phenomenon that is well known of tennismen when they lift the ball). We observe a trajectory that has the shape of a spiral that bends more and more along the path. A bead dropped on a solid makes a large number of bounces before coming to rest, losing a small fraction of energy in each collision. If the solid is covered by a thin film of liquid, the situation becomes radically different: the bead bounces once, or even stops without bouncing. The liquid film is subjected to brutal deformations (compression, shear, stretch) that quickly dissipate energy. We are trying to quantify this dissipation. This process occurs in the lungs, where dust particles are filtered out of the inhaled air by capture on the mucus-covered bronchial walls. Liquid coating of solids is part of many industrial processes, and can be performed in numerous different ways. One of them, called dip-coating, consist in withdrawing the solid out of a bath of the liquid at constant speed which leads to a liquid film of constant thickness. By balancing viscous forces responsible for the withdrawal of the liquid and capillary forces that oppose it, Landau, Levich and Derjaguin predicted the thickness of the film for a smooth surface. But the nature of the surface itself, and more precisely its roughness, affects the coating. For example, the deposited thickness on a rough surface is always greater than on a smooth one. Using textured surfaces with a very controlled roughness, we characterized this effect, and suggested a two-layer description of the phenomenon : the liquid trapped in the texture and the liquid that stands above this trapped film. We have shown that we have here a accurate and new tool to study the non-stick condition at the interface. Another technique widely used to coat surfaces consists in spreading a great quantity of liquid on the surface, then removing the excess fluid with a flexible wiper. The deposited thickness is thus determined by a new balance between viscous forces, which we aim to understand. 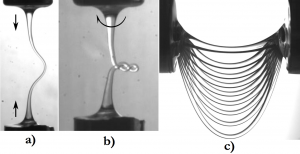 By stretching a drop of a very viscous liquid, we can make viscous filaments. These viscous threads are observed to deform like solid rods or threads. Viscous liquid and elastic solid constitutive equations are indeed similar. We observe this analogy in several experiments. For instance, when compressed at a constant velocity, a liquid thread can buckle like an elastic rod (figure a). If the filament is also twisted, it can form plectonems (figure b), i.e. loops. Last, an initially horizontal thread deforms under gravity and takes a catenary-like shape (figure c), as shown by Teichman and Mahadevan. In these experiments, we focus on the deformations and the associated viscous dissipation, in order to identify the characteristic time scales. However, these objets are still liquid and experience surface tension. As a consequence, hanging filaments thin because of capillary forces, which affects their mass repartion, hence their shape. Surface tension can also suppress buckling, is capillary, if capillary drainage is faster than compression. Objects, animals or ships moving close to the water surface generate remarquable patterns on the surface. 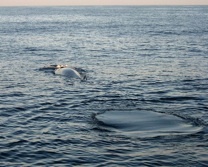 Whales, for example leave a smooth zone that lasts for several minutes where they plunge. The appartition of those zones seems to be linked to the specific shape of the flow generated by the whale. Creating flow of controlled vorticity at the surface on the water, we are trying to reproduce this phenomenon and to understand its governing parameters.